My colleagues Talia Welsh and Bo Baker asked me to visit their team-taught course Honors 3590: Non-Western Cultures: Zen, Film, and Anime at the University of Tennessee at Chattanooga. In preparation for this event, I thought I’d write a blog post to collect my thoughts on the film we’ll be discussing, which also happens to be one of my favorites. Note that I am discussing the original 1995 animated film directed by Mamoru Oshii. I’ve honestly never been a huge anime fan, but I’ve loved Ghost in the Shell since I first saw it in the 90’s. First of all, it’s one of the most beautiful anime films out there. The meditative city montages alone are worth the price of admission. But it’s also one of the most philosophically profound movies out there, anime or otherwise. It gets deep from the first moments. The intro tells us, “the advance of computerization … has not yet wiped out nations and ethnic groups” (Is there a reason to think it will?). There’s also the issue of all those lingering shots of the Major’s body: What’s the line between a problematic male gaze and artistic statements about corporality? But the deepest issue of all is personal identity. Consider the Major’s post-scuba diving soliloquy. 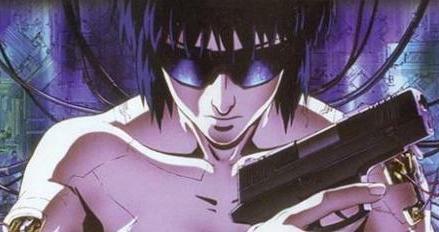 Like anime science fiction more generally, Ghost in the Shell combines modern, computerized themes with ancient philosophical roots. The personal identity questions in the film are asked with the accent of modern computer technology but the deeper grammar is that of Buddhist philosophy. Buddhism was first introduced in Japan in the sixth century CE. By this point Buddhism had existed in India for about one thousand years and had developed sophisticated theories of personal identity. In early Buddhism the centrality of personal identity issues can be seen from the fact that non-self is one of the three marks of existence along with suffering and impermanence. While there are some interpretive disputes, the idea seems to be that in all the universe there is not to be found a permanent essence called a self. Historically this was probably a reaction to the Upaniṣadic conception of a self (ātman); philosophically it’s a denial that there is a single, relatively permanent core that gives a person her or his identity. There are at least two senses in which personal identity can be an issue. The first is about what qualities define you as a person. Who are you? How do you relate to your background? Where do you fit into the world socially, politically, sexually, racially, ethnically, religiously, artistically, intellectually, morally, etc.? What are you doing with your life? What drives you? These are the sorts of identity issues faced by many young adults and many cyborgs, too, at least in Ghost in the Shell. Another sense of personal identity, the metaphysical sense that philosophers tend to talk about, revolves around the question: What makes you the same person over time? We say that you’re the same person now as you were when you were ten years old, but if you think about it you’re actually quite different. When I was ten, I was a lot smaller and beardless; my favorite Japanese animation wasn’t Ghost in the Shell, it was shows like Go Bots, Transformers, and Voltron. Today all of those things are different about me. Yet we say I’m the same person today as I was decades ago. This is numerical identity as opposed to qualitative identity (i.e., why do I count as one person even though my qualities have changed?). Of course these two senses might be related. At some point a severe enough change in qualitative identity might force a reevaluation of numerical identity. We debate whether a body in a vegetative state is a person with moral and legal rights (like the Terri Schiavo case). We wonder whether Grandma is really the same person after the onset of severe dementia. In Ghost in the Shell, we question whether the Major is really the Major by the end of the film. These tend to be the type of cases where the philosophical rubber hits the road of life. The Buddhist contention is that a deep rethinking of one’s position on numerical identity will radically alter one’s conception of one’s qualitative identity; if you don’t believe in a self, you will be less selfish and thereby suffer less. The Buddhist answer to these questions is a bit shocking: Ultimately there simply is no thing that gives you numerical identity over time. I am not, strictly speaking, the same person I was at ten years old. In the standard Buddhist analysis, a “person” is actually a collection of five aggregates: physical form, feeling, perception, volitions, and consciousness. There are all technical terms I don’t need to get into here, but the basic idea is that a person can be reduced to a collection of impermanent psycho-physical processes, an idea that at times seems to be shared by the Major and the Puppet Master. My favorite analogy is a cake and a famous Buddhist example is a chariot. Let’s keep things related to Ghost in the Shell with Togusa’s favorite revolver. A revolver can’t be reduced to any one of its parts (the trigger, the barrel, the cylinder, the grip, etc.). Neither is a gun merely a collection of parts; it doesn’t work if you put the parts in a pile on the table. If you think about it, a gun is really just an idea, a blueprint we impose on an object that happens to be useful for shooting nasty agents from Section 6. Ghost in the Shell uses the language of “ghosts,” which might seem to indicate support for a self theory. For instance, the characters know there’s something strange about the naked cyborg they find on the road because she has a ghost, which cyborgs lacking human brains aren’t supposed to have. However, I find a lot in the film that works against this theory. The film's title might be a nod to the 20th century English philosopher Gilbert Ryle’s idea of the Ghost in the Machine, or the idea that a mind is a ghost that pilots the machine of the body. Ryle called this "the Official Doctrine." He was actually criticizing this idea, which he blamed mainly (and somewhat unfairly) on the 17th century French philosopher René Descartes (Descartes is also explicitly mentioned in Ghost in the Shell 2: Innocence). I am also reminded of my favorite line from the 13th century Japanese Zen Buddhist philosopher Dōgen: “The Buddha Way is to study the self. To study the self is to forget the self.” What Dōgen seems to have in mind is that the point of introspection in Buddhism is not to find your self, but to realize that there was never a self to find in the first place. Part of the philosophical depth of Ghost in the Shell is that it starts with everyday, commonsensical notions of personal identity and moves beyond them. We meet our characters, who look like regular humans, but we soon discover that their bodies are partly cybernetic and under warranty by a shadowy corporation. We tend to identify our bodies as our selves, but this won’t do, since bodies change all the time due to ageing, weight loss/gain, replacing cells every seven years, etc. Cyborgization is merely a difference in degree, not in kind. Maybe our identity is a matter of psychological continuity rather than physical continuity? This is famously the type of view developed by John Locke (the 17th century English philosopher, not the character from Lost). The Major seems to hint at this type of theory early on. Spoiler alert!! ------ At the end of the movie the Major and the Puppet Master merge into a single entity, a process that contemporary philosophers call fusion. This raises the question: if you can merge with another person, how can you have been as separate as you thought you were? How can one person have the memories of two people? Could psychological continuity theorists bite the bullet and admit that two people could become one? Or does fusion rule out such theories? The Puppet Master explains that it’s doing all this to elevate consciousness and to become part of all things. In other words, the Puppet Master is seeking a form of non-dualistic consciousness. There are hints of this in Western thought (particularly in the work of Spinoza), and it is a prominent idea in some types of Buddhist philosophy. Non-dualism was a later Indian Mahāyāna development that became a much more central doctrine in East Asian Buddhism. Originally non-dualism meant that, in the absence of a self, there is no fundamental distinction between self and other or self and world. In East Asian Buddhism, this idea merged with holistic, non-anthropomorphic notions of nature in Chinese Daoism to create an idea that each of us is part of “the ten-thousand things.” We are not separate from nature, from each other, or from the universe. We are each part of a vast whole, and tapping into the underlying realities of this whole is a source of power and contentment, maybe even enlightenment. So the Puppet Master may be a futuristic computer entity born in the seas of digital information, but the goal is after all enlightenment of an old fashioned kind. Ghost in the Shell shows us that even in our computerized cybernetic future, there may be old ideas worth keeping around.